Avro Vulcan, originally uploaded by Robin Kearney. 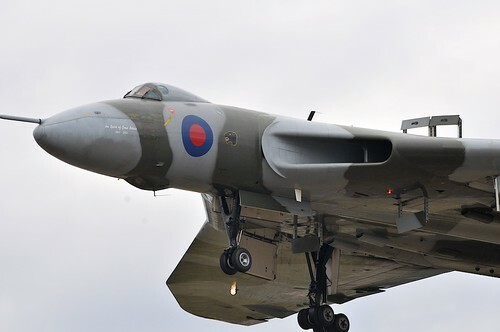 I have always loved the Vulcan since I was a kid, I have fond memories of seeing it fly at air shows my father took me too years ago, before it lost the airworthiness certificate. Thanks to the magnificent work of the people at Vulcan to the Sky XH558 is flying again, and for her fiftieth birthday too! I attempted to see a display last year at the Bournemouth air show, but sadly the flight had to be cancelled. This year my luck was in however, and at Farnborough Air show I once again got to see her fly. Amazing stuff!